This is a project I designed about a month ago, when I was dreaming of cooler weather in the middle of a heat wave. The colors of the yarn just screamed “fall” to me. I actually don’t have too many scarfs, which is unusual for a knitter, and no drapey cowls. So, I thought this would fit in perfectly with my wardrobe for fall, and would elevate a simple outfit of an oversized top and yoga pants (Yes, I am one of those people who thinks leggings are pants). I’ll try to add some pictures of the scarf on me, when the weather is finally cool enough to wear a scarf. 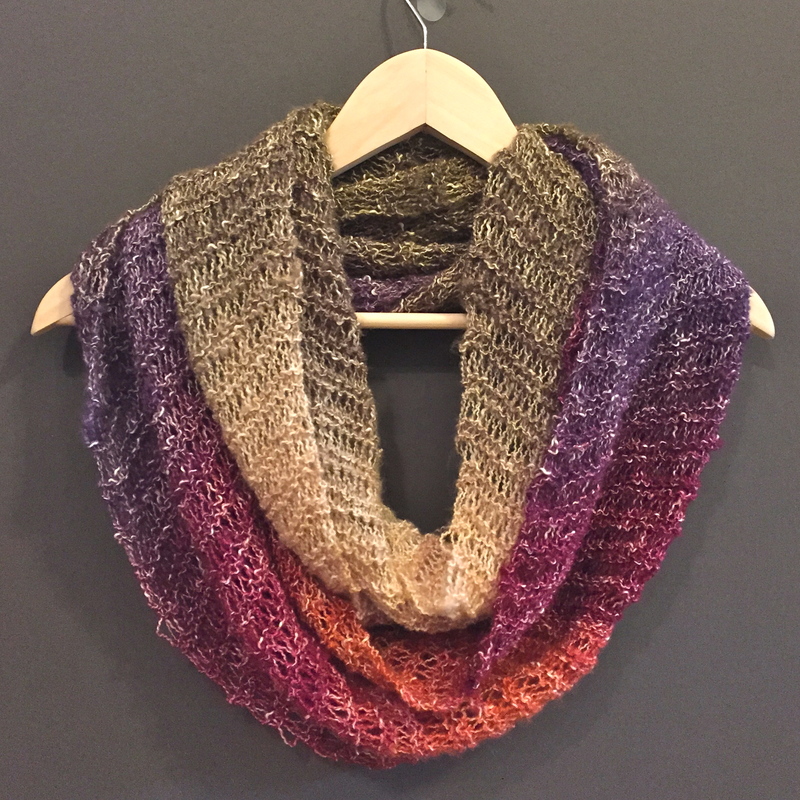 It is a great travel project because it only requires 1 ball of yarn and is a pretty easy pattern, but the color changes in the yarn and the bias knitting and dropped stitches keep it interesting. It would also be a good pattern for a relative beginner, looking to venture beyond basic the knit stitch. Or for Christmas gifts because the drop stitch knits up so quickly. One size, 10.5 inches wide, and 76 inches in circumference, which is long enough to loom around the neck twice. 1 ball “Shawl in a Ball” yarn by Lion Brand, I used the “Calming Desert” color way, and either 5.5 mm (US size 9, UK size I) straight or circular knitting needles. If you’ve never worked in drop stitch, here is a tutorial video I found on YouTube. This tutorial uses 3 wraps per stitch, and my patten only uses two wraps per stitch. Repeat this 4 row pattern until your scarf is 76 inches long, or whatever your desired length is. Cast off, and loosely sew the two ends together. I didn’t block my scarf, I like the drapey, scrunchy look of it. As always, I’d love to see pictures if you make this scarf, and feel free to contact me if you have any questions. This entry was posted in Autumn/Fall, Fashion, Free Pattern, Knitting on August 23, 2016 by RyanMcGurl. Yes, I do mean knit, and I’ve edited the pattern to clarify that. Thanks! Can’t wait to try this! I’ve been looking for a good pattern for that yarn. One question – on the wrap row, do you wrap the first and last stitch, or just knit? Thanks! Hi Lorraine, sorry its taken me a few days to answer your question. Yes, I did wrap the first and last stitches. Can’t wait to see your finished scarf! Love this cowl, it’s a beautiful pattern. Great Christmas present. One clarification please . Size of the needles .thank you. and knit the last stitch. The single increase at the beginning of the row and the decrease at the end create the diagonal direction of the knitting. Congratulations on being a new knitter! I hope this explanation helps and let me now if you have anymore questions, or send me a link to you finished project! When you say, work the first wrap and drop the second does that mean you knit the first wrap together with the adjacent stitch? Sorry, I’m not an experienced knitter and I’m trying to figure out how complete that row without dropping the first wrap and not increasing the stitch count!!! Thank you for your help! !